You see her honest and candid style: Andrea Leadsom answers a personal question directly (she ‘does God’), but isn’t so steeped in the dark arts of discursive articulacy as to be able to deflect and obfuscate. Or perhaps she is, but helpfully chooses not to where her faith and moral values are concerned. She is a Christian – a proud Christian – and has absolutely nothing to hide under a bushel. The other Tory leadership hopeful Theresa May is also a Christian – the daughter of a vicar, no less – but she doesn’t talk about it at all. It’s a private matter: Theresa May’s Christian faith may or may not inform her politics: we just don’t know. Bushels abound. Indeed it was and indeed it is. Such is our secularised media: it’s okay to believe in God, as long as you don’t believe too strongly. The invective duly poured forth, like pus out of an abscess: Leadsom the religious nutter, zealot, bigot, homophobe, etc., etc. “She’s just not ready to be PM”; “Not PM material”; “Leadsom doesn’t have the experience the country needs..”, determined the High Court of Twitter – especially those who happened to support Remain in the EU Referendum, for whom Andrea Leadsom could never be fit to kiss their children, let alone lead the country. …are an heritage of the Lord: and the fruit of the womb is his reward. Andrea Leadsom gave another honest and candid interview to the Times, and spoke about motherhood and apple pie. But the Times headline omits the apple pie bit, which is a pity because most of the country will only read the headline and draw their split-second conclusions. ‘Being a mother gives me edge on May — Leadsom‘. It’s callous, heartless, wicked stuff: gospel truth in a tabloid soundbite. But of those who read the whole article, how many will bother to source the original transcript? How many will read the agonisingly compassionate words “So, really carefully..”? Will the Times release the recording so we may hear her tenderness and sense her humanity? Who will bother to listen to that? 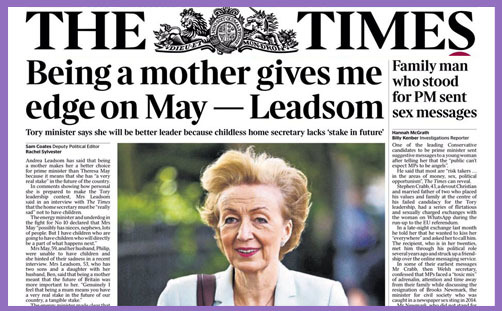 Andrea Leadsom patently said: “I am sure Theresa May will be really sad she doesn’t have children so I don’t want this to be ‘Andrea has children, Theresa hasn’t’, because I think that would be really horrible.” But that’s precisely the line the Times chooses to splash across its front-page. Daggers out. Horrible it is, and Mrs Leadsom is justifiably angry. Apparently, we don’t only live in a country where it’s increasingly impossibly to ‘do God’ in public life: it is one in which it is no longer permissible to be proud of motherhood without being accused of denigrating singleness or taunting infertility. Isn’t it simply a statement of social fact that having children keeps you focused on things which those without children do not need to? If you are about to give birth, are you not a little more invested in the quality of midwifery? If your children are at school, are you not a little more concerned about teaching standards and school performance? If your mother has Alzheimer’s, or your uncle prostate cancer, do you not understand and feel a little more, a little differently, a little deeper? Andrea Leadsom may be naive in dealing with the media, and she may occasionally express herself clumsily – that is, with words or phrases which may be easily excised from their context and distorted. But David Cameron gave ‘car-crash’ interviews in his early months. So did Justin Welby. And so, please God, might they and all people in public life continue to do so. They are human and fallible, and if they may not err they must never again speak to the media, and so the light of their values and beliefs will remain secret, buried beneath a mountain of bushels. Andrea Leadsom has a desire to be honest and open about her faith, her family, her sense of patriotism and her Christian moral values. She is deeply, passionately concerned with that place where the rule of law meets the life of faith. In her humility she makes a vow to her country. It may not be entire, whole and perfect, but it is the service of her love. The least the media could do is to treat her motives, faith and meanings fairly. Just like they did Sadiq Khan.